A region’s overall prosperity is related to the quality of its infrastructure. People rely on transportation and communication networks for access to employment, goods, and services. Businesses also rely on infrastructure to provide access to trade, raw materials, labor, and other inputs to production. The responsible use of natural resources by residents is also important, as energy and water use can affect long-term regional sustainability. Responsive and well-planned infrastructure results from a collaborative process between residents and policy makers, improving current levels of service and meeting future demand. Data presented in this category identify key trends in infrastructure performance, and provide a valuable basis to inform future decisions related to its development. Indicators in this category can be closely tied to a region’s economy, workforce, and quality of life. For example, high-quality infrastructure may facilitate stronger employment, population growth, and gross domestic product. Furthermore, commute times can reflect the spatial relationship between housing and employment. 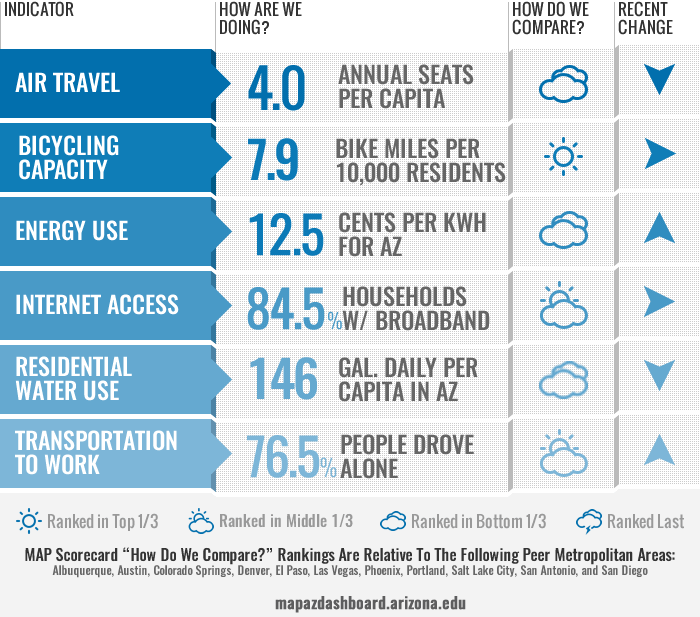 Improving performance among the indicators included in this category could provide better access to jobs, and reduce travel time and energy costs for residents.